Vie des Arts Est., Geneva; sold 1973 through (Pierre Matisse Gallery, New York) to NGA. Henri Matisse 1950-1954: Les grandes gouaches découpées, Kunsthalle Bern, 1959, no. 11, repro. Henri Matisse: Les grandes gouaches découpées, Stedelijk Museum, Amsterdam, 1960, no. 11, repro. Henri Matisse: Les grandes gouaches découpées, Musée des Arts Décoratifs, Palais du Louvre, Paris, 1961, no. 18, repro. The Last Works of Henri Matisse: Large Cut Gouaches, The Museum of Modern Art, New York; Art Institute of Chicago; San Francisco Museum of Art, 1961-1962, no. 14, repro. Henri Matisse: Exposition du Centenaire, Grand Palais, Paris, 1970, no. 222, repro. 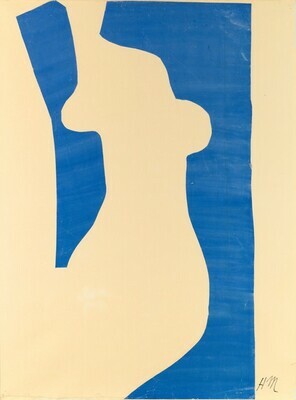 Matisse: en retrospektiv udstilling, Statens Museums for Kunst, Copenhagen, 1970, no. 110, repro. Matisse as a Draughtsman, Baltimore Museum of Art; California Palace of the Legion of Honor, San Francisco; Art Institute of Chicago, 1971, no. 82, repro. Henri Matisse: Paper Cut-Outs, National Gallery of Art, Washington; The Detroit Institute of Arts; The St. Louis Art Museum, 1977-1978, no. 181, repro. Aspects of Twentieth-Century Art, National Gallery of Art, Washington, D.C., 1978-1978, no. 91, repro. Henri Matisse: Das Goldene Zeitalter, Kunsthalle Bielefeld, 1981, no. 17, repro. Drawings and Papiers Découpés by Henri Matisse, Staatsgalerie Stuttgart, Germany, 1993-1994, no. 150, repro. 270. Matisse-Picasso, Tate Modern, London; Galeries nationales du Grand Palais, Paris; The Museum of Modern Art, New York, 2002-2003, no. 177 (English cat. ), no. 154 (French cat. ), repros. Henri Matisse: Figur Farbe Raum [Henri Matisse: Figure Color Space], Kunstsammlung Nordrhein-Westfalen, Dusseldorf, 2005-2006, no. 196. Matisse: La seduzione di Michelangelo, Museo di Santa Giulia, Brescia, 2011, not in catalogue. Henri Matisse: The Cut-Outs, Tate, London; The Museum of Modern Art, New York, 2014-2015, no. 115, repro. European Paintings: An Illustrated Catalogue. National Gallery of Art, Washington, 1985: 264, repro. Hand, John Oliver. National Gallery of Art: Master Paintings from the Collection. Washington and New York, 2004: 419, no. 352, color repro.